Flight over the white Clouds and the Boulder Mountains on friday morning. Boulder Mountains. A flyover of the Boulder-White Cloud Mountains reveals the vast acreage of roadless lands in the region north of Ketchum. A group of mountain biking advocates and industry leaders flew over an area in the Boulder-White Cloud Mountains on Thursday to highlight an effort to designate about 591,000 acres in the area as a national monument. An alternative wilderness bill is pending in Congress that would protect 275,665 acres in the area, but keep mountain bikers out of most areas. “There is a role for the mountain biking industry to elevate the campaign for national monument status,” said International Mountain Bicycling Association Communications Manager Aaron Clark. Clark spoke to a group of flyover participants at Friedman Memorial Airport before they disembarked in groups of five for a one-hour flight north to Castle Peak in the White Cloud Mountains in a Cessna 210, piloted by Ecoflight founder and Executive Director Bruce Gordon. The flights were co-sponsored by the Wood River Bicycle Coalition, a local chapter of IMBA. IMBA is a nonprofit educational organization with an annual budget of $5.6 million and 200 local chapters nationwide with other independent affiliates around the world. The organization advocates for mountain bike trail access, sustainable trail development and public policies that are friendly to mountain bikes. “We want to protect the places we ride. That’s what led us into land protection,” said Clark. IMBA, established in 1988, provided mountain bike trail design and consultation eight years ago for Sun Valley Co.’s Gun Club Trail around a Sun Valley golf course. A proposed Boulder-White Clouds National Monument was first proposed by then-Secretary of the Interior and former Idaho Gov. Dirk Kempthorne in 2008, though it was never presented to President George W. Bush for approval. The idea was resurrected in July 2010 by former Idaho Gov. Cecil Andrus—also a former secretary of the Interior—in a letter to President Barack Obama. 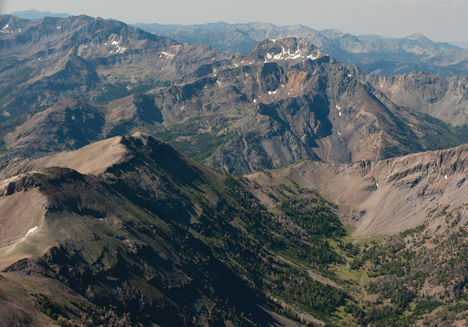 However, on July 2, Rep. Mike Simpson, R-Idaho, succeeded in getting a bill to protect three areas in the Boulder-White Cloud Mountains as wilderness to the floor of the U.S. House of Representatives without objection from the House Natural Resources Committee. The flyover group also included Rich Cook, director of development for IMBA; Brett Stevenson, president of the Wood River Bicycle Coalition (local IMBA affiliate); Mark Bettinger and Zach Waterman of the Sierra Club; Jessica Klodnicki, the general manager of Bell Helmets; Chris Sugai, president of Niner Bikes; Jenn Dice, the Washington, D.C., lobbyist for People for Bikes; Luther Propst, board member of the Outdoor Alliance; and Vernon Felton, a writer for Bike magazine and Mountain magazine. Cook said based on ideal and challenging terrain through which these “marquee trails” extend, his organization was considering naming them as “IMBA epics,” a designation that would draw attention to them within the international mountain biking community. Clark said IMBA sent a letter to Simpson and Sen. Jim Risch, R-Idaho, signed by 60 outdoor business owners asking to keep the two trails open to mountain bikes. Simpson responded on his official website, saying, “While I am not a mountain biker, I have been told by members of the mountain bike community that my bill will continue to provide a wide variety of back country experiences for mountain bikers, from beginner to advanced-expert, on some of the most rugged and scenic high elevation trails in the United States. “For those advanced-expert mountain bikers, we leave open the epic Bowery Loop to the East Fork (Germania Creek Trail and Grand Prize/West Fork of East Fork Trails). This allows for loop access from Smiley Creek to the East Fork of the Salmon River and back—described as “abusive” in a mountain biking guidebook. This grueling 30-mile loop lies between the proposed White Clouds and Hemingway-Boulders Wildernesses. “Additionally, the difficult Garland Lakes/Martin Creek Trail to Warm Springs Meadow, and Rough Creek and Lookout Mountain trails will remain open. Riders will see incredible scenery as they head up the Big and Little Casino Creek Trails, as well as the Boundary Creek, Gladiator Creek and Galena Gulch Trails. Much of the area covered by the Boulder and White Cloud mountains—on the east side of state Highway 75 between Ketchum and Stanley—is included in the Sawtooth National Recreation Area. That designation protects it from development that would substantially impair its scenic and recreational values. However, many conservationists have feared an expansion of motorized recreational use in the area, and have advocated wilderness designation to prevent that. In 2005, Rep. Simpson introduced his Central Idaho Economic Development and Recreation Act, which would have protected part of the area as wilderness while allowing most existing motorized use and providing economic benefits to Custer County. The bill never made it out of Congress, due partly to opposition from Risch and Idaho Gov. Butch Otter. Simpson’s revised bill, however, appears to have more support from the Idaho congressional delegation.